In June 2013, I almost had a breakdown. I was 27, an architect, and had achieved everything my culture had taught me to strive for—but I still felt miserable. I quit my job, sold everything, lost my boyfriend, and set out with a simple question: “What makes me happy?” I was blessed to find meditation at the first stop along my path. 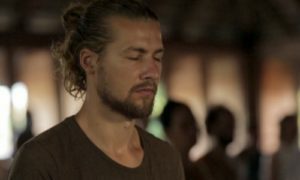 I participated in a 10-day Vipassana course in Burma and it changed something deep within me. I felt refreshed again, cleansed and open, ready to see the world and myself with new eyes. 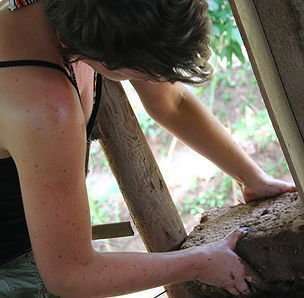 From there, I traveled to Thailand and found permaculture thanks to a TED Talk that inspired me. Permaculture and natural building were like a clear light shining through the cultural haze. They showed me that we don’t need to work in an office doing a job we don’t believe in to buy stuff to make us happy. It’s a choice we make. With tireless energy and determination, I followed this bliss to homesteads, intentional communities, off-grid schools, and permaculture centers in Ireland, Canada, Argentina, and the United States. It felt so liberating to volunteer… Giving myself to help others create their dream lifestyle. In return, I received food, homes, learning, experience, and an invaluable glimpse into possible life choices and what makes others happy. I’ll skip forward to last summer when I had achieved two of my newly envisioned goals. I had built a whole house and was teaching cob building courses in Oregon. Looking back now, I can see how old habits had started to creep back. When was it that I stopped focusing on joy and began thinking of ambition, pressure, and achievements? Where was the balance between aspiration and ego? I was confused. So, I went back to England to reflect. I spent the first couple of months this year in a very different state of consciousness, though. My mind struggled to let go and, at the same time, to comprehend the intense energy, awareness, presence, and new perspectives that I had been gifted. It was very disconcerting for those around me. The limited spiritual teachings I had been exposed to had not prepared me for this and I slipped into a crushing state of suffering and self-doubt. Luckily, at this point I arrived at Hridaya! I can’t express my gratitude enough for the community of accepting, supportive, authentic human beings who inhabit this place. On top of this, Hridaya Hatha Yoga gradually helped to rebalance my energy levels and allow me to gently reconnect to my body. And the teachings… Oh, how I needed them! The void is terrifying when you peer in from over its sharp edge. 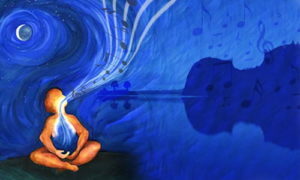 The love, beauty, and joy spoken of at the Hridaya Yoga Center can really smooth it over. I felt that I had no purpose, but I was starting to realize that our only purpose is love. The deep lessons of selfless service helped me let go of attachment to the outcomes of my actions and apply the values of presence, compassion, and patience in real life. With this beautiful lesson in my heart, I conclude my three-month experience serving as a karma yogi. I again felt nourished and accepted, capable of loving others and myself. I still don’t know what happened at the start of the year, but I have much more acceptance of “not knowing.” I can trust the universe again, knowing that it will guide me to the lessons I need to experience. I am regaining the confidence to teach from the heart, sharing my experiences of mindfulness and the Earth. But mostly, I’m thankful because I have the chance to listen to her, the one who has always been my most trusted teacher. Thank you Hridaya, you have helped me find my way back home. Louise is an architect, artist, and builder who teaches natural building and mindfulness. If you would like more information or inspiration about building with earth, visit her website. She welcomes inquiries about your dream earth project and/or helping to teach courses worldwide. If you feel inspired by Louise’s account, consider joining the Hridaya Karma Yoga Program.